The first thing that came to our mind when we saw this house is that it looks clean, beautiful and unique. Despite its low lying design, it seems to raise itself on a pedestal because of its architecture which is very attention grabbing. 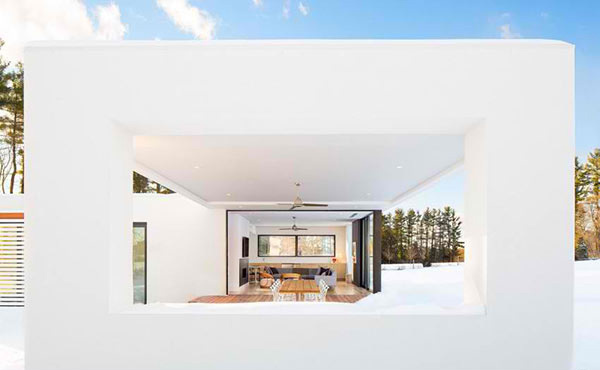 From the glass walls to the concrete box style of the exterior, the house is a treasure. Shirley Road is a contemporary addition a 1930′s Sears kit house located in Groton, a town in northwestern Middlesex County, Massachusetts, USA. 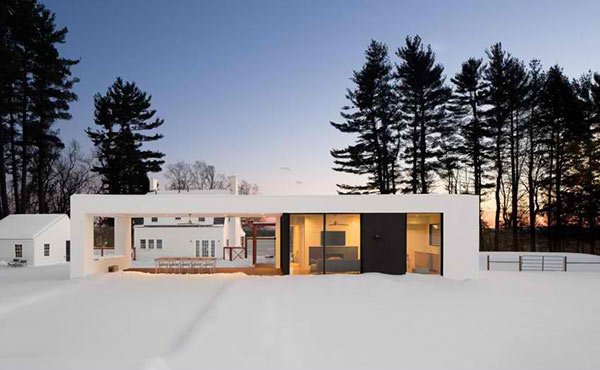 It “started with a 1930′s Sears kit house set upon 3 gently rolling acres overlooking substantial preserves about an hour outside of Boston. While charmingly renovated, the existing structure offered only very small-scale spaces which couldn’t really accommodate family and guests looking for escape to the countryside.” Because of this, designers from LAB house, doubled the floor space adding two beautifully scaled rooms. It has a utility space, a bathroom with outdoor shower and a 500+ ft2 covered loggia which blends effortlessly with the main living space. 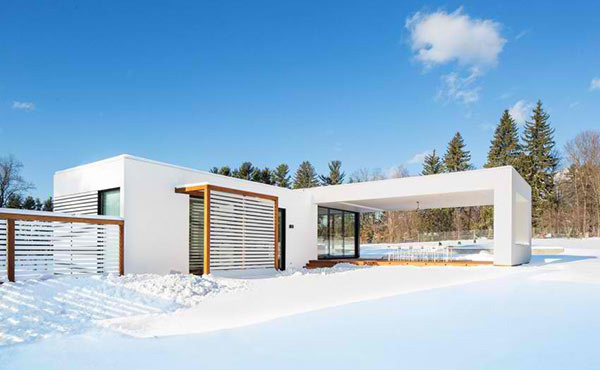 With the trees that surround the house, it looks even more gorgeous especially with its sleek lines. Even as a mere addition to an existing house, it was designed like a new structure is being made. And it looks very stunning indeed- from afar and when you are close to it. 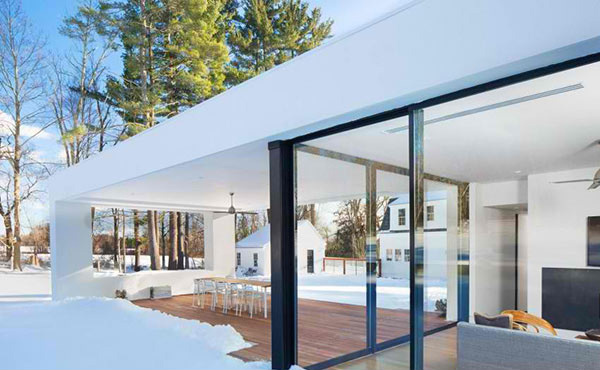 We love the style of that cantilevered area extending to a patio. And we love its long shape containing staggering interior spaces. 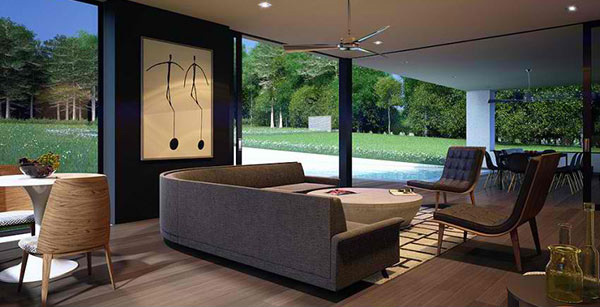 Its multi-panel pocket doors allow the connection between the interior and the environment. 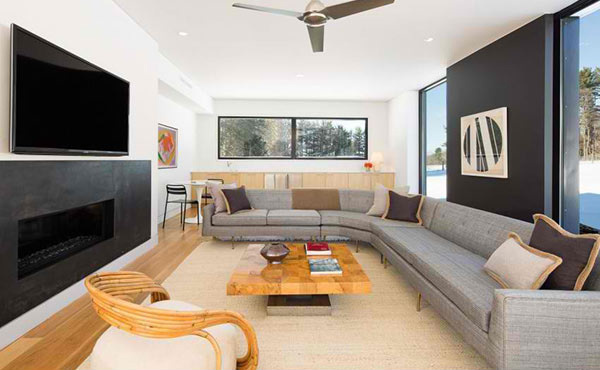 Inside, it looks even more inviting just like this living area with a C shape sofa that bends around a modern fireplace. Wooden furniture brings in the beauty of nature into the home. And we love that geometric wall art on a black wall! 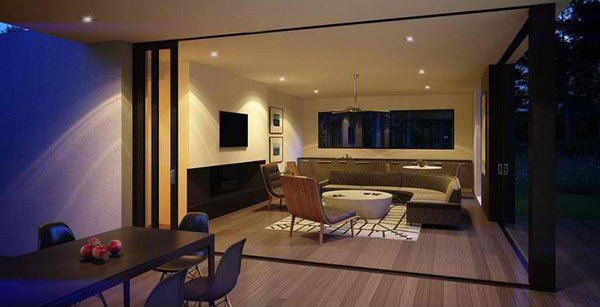 This lounge area looks dramatic and intimate because of its dim light and its arrangement. You can see here the pocket doors that can be opened and closed when needed. We are not sure what type of partition this one has but the way it looks, it can be closed for privacy in the area. The area rug in this space adds more appeal to it as well as the c-shape sofa that seems to go around the circular coffee table. 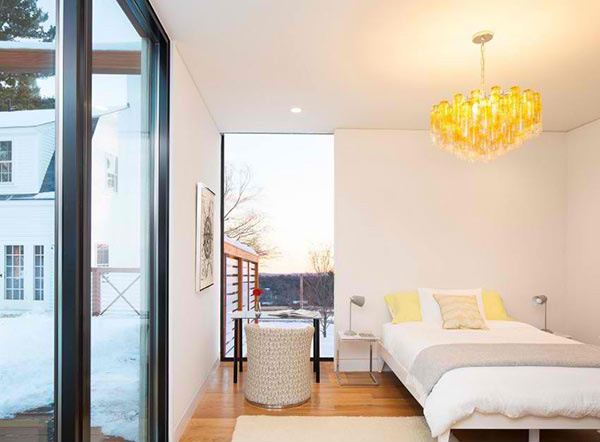 And this one is the bedroom looking very sophisticated because of the yellow chandelier and the subtle patterns in it. 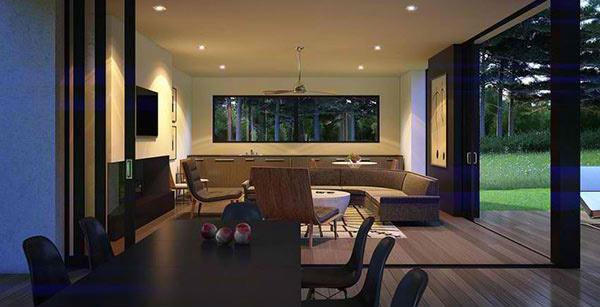 The Boston based company LABhaus did great in designing this home. 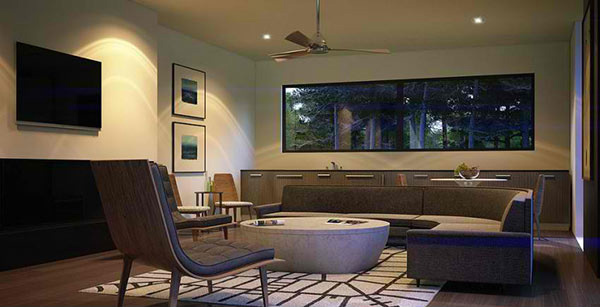 Aside from its astounding exterior, it also succeeded in creating an interior that will make the homeowners feel happy and comfortable of the place they good. The way we see it, they really have much to be proud about! What can you say about this house feature of the day?